Found-footage is, once and for all, dead. It is no more. It has ceased to be. It’s expired and gone to meet its maker. It’s a stiff, bereft of life. It rests in peace. If it hadn’t been nailed into its coffin, it’d be pushing up daisies. Its metabolic processes are now history. It’s off the twig, kicked the bucket, shuffled off its mortal coil, run down the curtain and joined the choir invisible. This… is an EX-GIMMICK! Hey, if The Gallows can rip-off the horror genre, then we can rip-off famous Monty Python sketches. It’d be far more entertaining, anyway. Needless to say, if you thought films like Project Almanac, The Devil Inside and Project X were stabs against the chest of the subgenre, then The Gallows is the one that pierces it through the heart (chanting, we imagine, “For the Watch” as they do it). Taking everything that is widely hated about the gimmick and assembling them into an 81-minute cut, this film exceeds the levels of stupidity and annoyance that one associates with a found-footage movie, let alone a horror one, and brings them into an unbearable existence that can only be described as this movie. Want to know more about this mess? Well, the set-up is that roughly twenty years ago, a school production of a play called The Gallows went horribly wrong when an on-stage accident caused the live hanging of a student named Charlie. Present day, and the school is reviving the play – which in and of itself is an incredibly ill-advised idea, the first of many in this flick – with the sporty Reese (er, Reese Mishler) being reluctantly cast in the same role that Charlie played. When it becomes apparent that Reese simply isn’t into it, his friend and designated camera man Ryan (erm, Ryan Shoos) along with his girlfriend Cassidy (ugh, Cassidy Gifford) convince Reese to break into the school at night via an unlocked door (y’know, cos a school wouldn’t think to put a chain and padlock around it, especially when EVERYONE knows about it) and destroy the set, soon being accompanied by fellow student and Reese’s crush Pfeifer (argh, Pfeifer Brown – seriously, what is up with having the characters’ names being the same as the actors’?!). That’s when the ghost of Charlie shows up and yadda yadda yadda, insert spooky stuff here. Well, we use “spooky” in the lightest sense possible because there is an actual lack of scariness throughout. The entire movie, there is not one inspired moment that gets the audience truly jumping out of its seats, and the ones that they do try and scare you with have either been done a million times over in much better horror movies, or had been showcased in the film’s trailer and poster. Instead, what does this movie think it has going for it? Nothing but a bunch of stupid and forced jump-scares, which truly is the lowest common denominator of cheap scares in any film of this genre. One is so particularly loathsome and pointless that it actually needs describing – for a good solid minute we see nothing but this static shot of a room with a TV playing in the background, when suddenly one of the characters pops into the frame wearing a face-covering hoodie and mock-screaming into the camera. Not only is there absolutely no point to this scene other than the aforementioned “scare” but it plays like one of those really bad YouTube videos that are so desperately trying to be a viral hit but ends up looking really shallow and pathetic – much like the rest of the film, in fact. There’s an uncomfortable sense of assholery in modern teen-centric horror flicks, which is part of what makes most of them so unbearable, but the characters in this film are such conniving and loathsome little shits that you’re counting down the minutes until they’re all axed off. Reese is just a boring, good-looking athlete stock character, while Pfeifer and Cassidy both fit the mould of “obnoxious and exploitatively attractive” females. But taking the biggest chunk from the cake of hatred is Ryan, the one with the camera and also the one that you want to die in the most gruesome way possible, he’s that much of an arrogant douchebag. There is even a point in this film when he’s at his most manipulative and aggressive that this reviewer actually shouted out in the middle of the screening: “Why is anyone friends with this guy? !” If anyone, the ghost of Charlie is the most likable person in the film, least of all because he’s actually trying to kill Ryan and rid the world of his awfulness. It’s a dumb enough excuse for a horror movie, but the use of the found-footage gimmick is what truly sinks both the movie and the style all at once. First of all, if you’re going to be breaking in to anywhere and thereby breaking several laws at the same time, you don’t want it all to be documented on a video camcorder and then imply that you’re going to show it to other people afterwards. Second, the film cheats constantly and uses multiple devices to record everything, including an iPhone and a miraculous second functioning camcorder, which eliminates the whole point of a unique perspective in this type of film (also, the police “blurb” at the start of the film states that this is all from the one camcorder, so how on earth did they manage to find and edit the footage on the other cameras in this movie?). 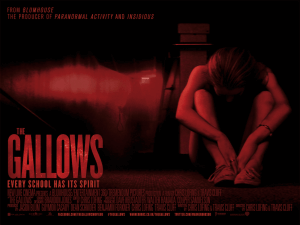 Third, much of the film is set in the dark corridors of the school, and aside from a handy light and “night vision app”, shooting your film half in pitch black with only audio of people screaming each other’s names only serves to undermine the visual prowess of not just a found-footage horror film, but film in general. These three strikes are more than enough to solidify the fact that this gimmick, that was once so innovative and unique, has now become exactly that: a gimmick, used by cynical filmmakers to save a quick buck whilst they’re filming and not once thinking about how it can be tied in to the story in any way. Found-footage is officially dead and buried. All that The Gallows did was lower the coffin further into the ground. The Gallows is one of the most cynical horror films in years, proving once and for all that – along with its loathsome characters and crucial lack of scares – the found-footage gimmick is well and truly dead by this point.